He maintained that the restoration of the nation of Biafra is a priority and a project that must be achieved under the watchful eyes of the IPOB led by himself, an arduous task that must be accomplished in order to lead his people out of the contraption called Nigeria, without fear of death. 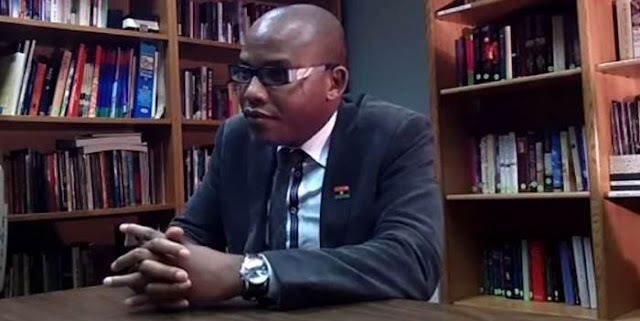 The Media and Publicity Secretary of IPOB, Comrade Emma Powerful who disclosed this yesterday in a press statement, quoted Kanu as telling some sympathizers who visited him in prison custody that he had even dedicated his life to restore Biafra, just as our Lord Jesus Christ dedicated His own life for the salvation of mankind. According to Kanu, “the reason my mother gave birth to me was to restore and save Biafrans. I also promise that the Biafran race will be a cleaned up nation and all the people of Biafra will come back home, if they are living outside the country of the new nation. Our people will no longer wander on the road again”. He queried: “How can I encourage the people of Biafra to work towards the upbringing of Nigeria, when we don’t hear the same language, don’t eat the same food and don’t have the same culture. In fact, if we come to their land to practice our culture and religion, we will be beheaded.